Electric garage doors are very common nowadays both in residential and commercial areas. 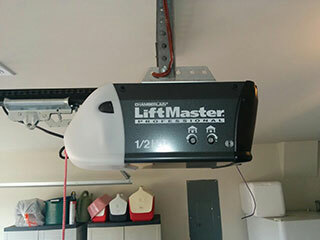 A garage door opener is installed in order to automatically operate these doors. There are various reasons as to why many owners decide to upgrade to this option, including the convenience it brings. There’s no need to lift the door with your hands or go out of the car to open or close it. Remote controls or clickers are used instead, which can operate from a distance. It also offers improved security protecting the property from intruders, since it doesn’t come with locks that can be picked and codes generated to change randomly. There are generally three types of door openers to choose from and they are belt drive, chain drive, and screw drive garage door opener. Belt drive openers have the quietest operation, although they are on the costly end. Chain drive openers are the most affordable and are also known for their durability, although they are the noisiest to operate. Screw drive openers on the other hand stand on the middle of the two other types. They are also on the affordable side, not too noisy, although not as quiet as chain drives. Several brands of door openers are available in the market. Those that have a proven record in the business when it comes to their quality are the best options and we’ll go through the top brands below so potential buyers can weigh their options. Genie is one of the most trusted brands in the US. The brand was created by the Alliance Manufacturing Company, which was founded in 1923; although the first Genie opener was made in 1954. Reliability, safety, and design are what the company aims for. They are continuously innovating to provide better features to customers. Parts and remotes are easily available so replacement is not difficult if required. Some of the features that Genie openers have are Intellicode technology which makes it possible for the opener to change codes on every use and Safe-T-Beam infrared system that prevents accidents by automatically reversing the door when something is detected on its path. Liftmaster is another favorite door opener brand. State of the art door openers are what the brand offers. The company is dedicated to producing quality products, which has been their goal for over 45 years now. It uses MyQ Technology, allowing owners to control and monitor door openers, as well as gate and door operators using a computer, tablet or smartphone. Openers also come with battery backup allowing persons to continue operating their door automatically even when there’s a power outage. Experts in Garage Door Repair Riverton say that this brand has one of the longest standby times. Other great door opener brands are Sears Craftsman, Allister, and Chamberlain. All of these brands are great choices. The decision on which specific door opener to purchase depends on your own needs. Aside from the type of opener, another factor to consider when deciding on which product to purchase is the horsepower. Door openers have varying horsepower, which determines what doors they can lift. You should know the weight of your door in order to find the opener that best suits it. Getting one that does not have the power to lift your door may result in damage or difficulty of operation. Standard doors usually need a ½ horsepower opener. Heavier doors like carriage doors may need ¾ horsepower. The heaviest types of doors require the most powerful openers with 1 horsepower. If not sure what type of opener to get, it’s safer to purchases one with a higher power.